In February fifth & sixth class had a "Retreat Day" in school. 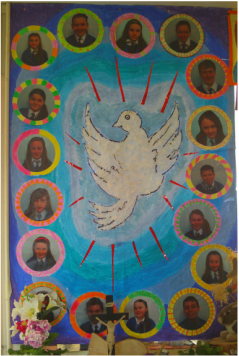 Mr. Paul Fitzpatrick & Mr Ted Laffey came to our classroom and helped us to reflect on the Sacrament of Confirmation and especially on the "Gifts of the Holy Spirit". Our Sacred Space with the cross & bible, the word of God on it. The many colours symbolise our uniqueness and just like the rainbow , when we join together in harmony , we can change the world into a beautiful place . It was a great day. We listened to bible stories, prayed together, sang songs together, reflected and finished with a prayer service with the whole school & some family & friends. We had a wonderful day. Rev. Bishop Michael confirmed us in St. John The Baptist Church in Rath. Everybody participated in the ceremony. Some pupils did readings, read prayers, sang hymns, played instruments & brought up gifts to the altar. Fr. Moorhead , our parish priest & Fr Walsh from Kilcormac celebrated mass with Bishop Michael Smith. We were anointed with the oil of chrism and we told the bishop our Confirmation names. Everybody took the pledge. We look forward to the Holy Spirit guiding us through life. 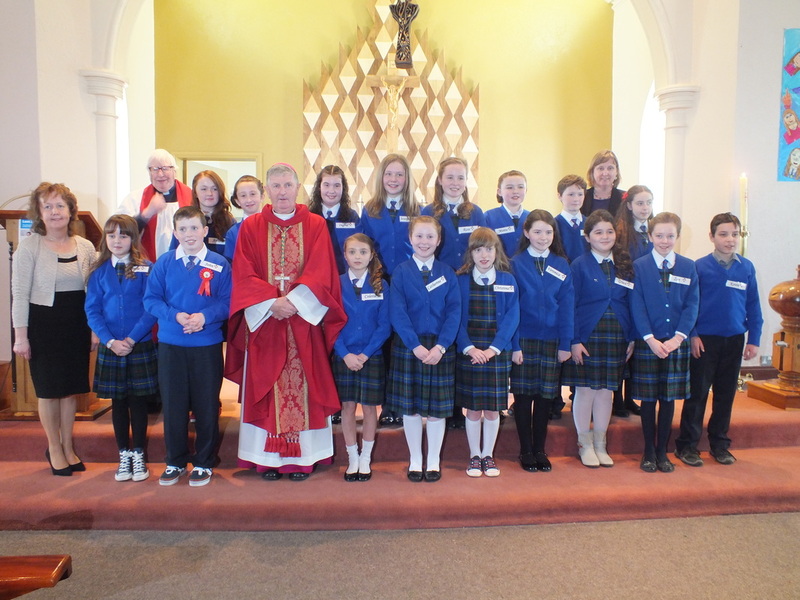 Bishop Michael Smith visited our school after the Confirmation Mass. Here he is with a group of children from 3rd & 4th class, Ms Walsh, Mrs Davis & Ms Howell.